Win free spins and bonuses on your favorite slots this weekend! Do you need to make some extra cash this weekend? Why don’t you play CasinoEuro slots for the weekend surprise promotion? CasinoEuro offers many prizes and bonuses and the Weekend Surprise is among the most popular. 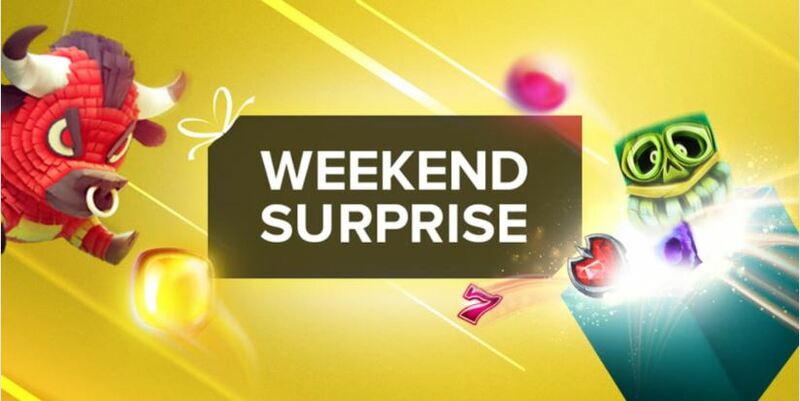 Set yourself for a surprise gift every weekend on Casino Euro. You can receive anything, from super spins, bonuses and CasinoEuro free spins, just by making a deposit of €10 or more, on any day between Monday and Thursday. At CasinoEuro, you can turn every Sunday into a payout day! Sign-up for a surprise gift! Players must make a minimum deposit of €10 to participate. Free Spins must be wagered 15x and within five days, for you to request payments. If you do not meet the wagering requirement within five days, the CasinoEuro bonus shall be lost. Cash bonus must meet a 10x wagering requirement before any withdrawals are made. Note that not all games contribute to the wagering requirement. Also, certain games will contribute towards the wagering requirement, more than others. For instance, Casino Euro slots offer 100% wager contribution and Texas Hold’Em Poker offers only 20%. Baccarat, Pai Gow Poker Games, Punto Bunco and Beat Me are the least contributors, with only 5% to offer. Other bonuses that Casino Euro offers are the welcome bonus, daily and weekly jackpots. By playing Book of Dead on any day between Monday and Friday, you stand to win up to 10 Free Spins. For every daily deposit of €15, you receive 50 CasinoEuro Free Spins to enjoy. However, the daily CasinoEuro bonus is only available to UK residents and one must manually activate the promotion. Failure to claim the bonus or reach the wagering requirements within five days results in loss of all winnings tied to the bonus. New players are eligible for 100% welcome bonus of up to €50 and 25 Free Spins. If you accept the welcome bonus, you must meet a 40x wagering requirement within 5 days, to make any withdrawals. CasinoEuro offers a guaranteed daily jackpot, where players stand to win huge prizes every day. At CasinoEuro, a jackpot must be won daily, so why not try your luck? Hit the Daily Jackpot lobby and get 3 jackpots for some amazing prizes. Hit the jackpot at CasinoEuro!